A Matter of Memories: :DAILY INSPIRATIONS: March Prize Drawing Coming Soon! :DAILY INSPIRATIONS: March Prize Drawing Coming Soon! 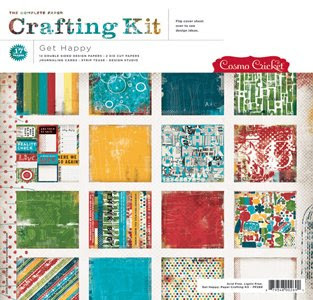 Remember, for every challenge you complete, you earn yourself a chance to win the March Daily Inspirations prize - the complete Cosmo Cricket Get Happy Crafting Kit!! You only need one layout for a chance to win, but the more you complete, the better your chances!! 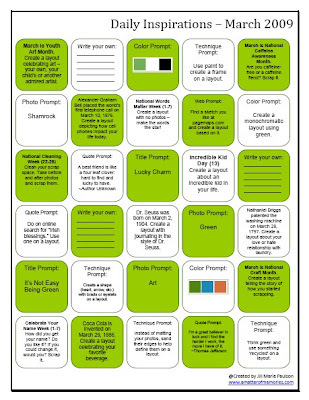 Layouts must be new and created for this challenge. Upload to your favorite online gallery and leave a link in the comments of the corresponding Daily Inspirations announcement post. A link back to AMOM's Daily Inspirations in your gallery posting would be greatly appreciated, although not required to win. If you do not upload to online galleries, you may email your entry to me at jillmarie7276@yahoo.com (images should be 100K or less, please). In comment link or email, please include your name, email and challenge square used for the entry. Entries are due by the 5th of the following month. For example, March entries are due by April 5th. Challenge squares may be combined onto one layout if you wish, but only one chance will be given per layout entry. The more challenge squares you complete, the more chances you have to win! A random drawing will be conducted to determine the monthly winner and will be notified by email as well as being announced on the blog. The April 2009 Daily Inspirations and monthly prize will be posted soon.